Jim Rome has the highest net worth of all TV and radio sports commentators. The host of CBS sports radio’s “The Jim Rome Show” has accumulated around 75 million U.S. dollars in his years of commentating. 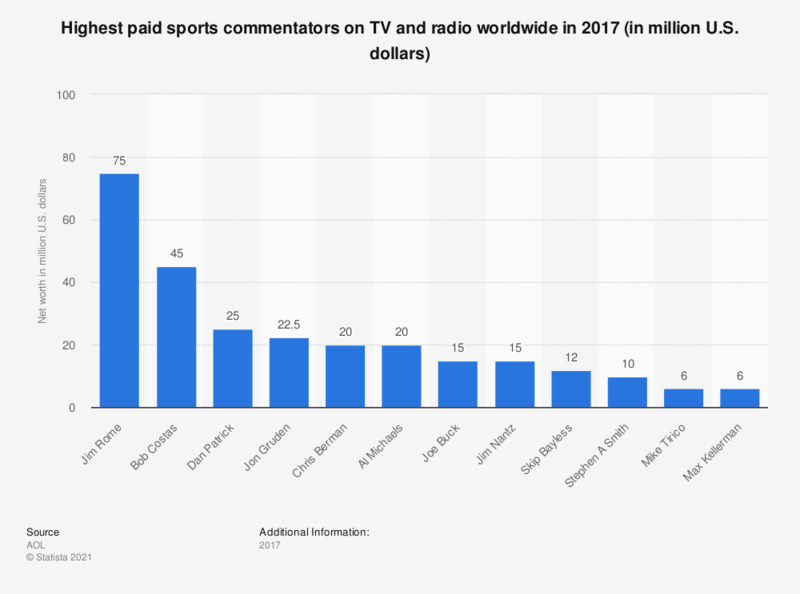 With sports leagues such as the NFL averaging millions of television viewers per year and events like the World Cup ranking among the most watched broadcasts in the world, it’s easy to see how the commentators that discuss these events stand to benefit greatly from their close proximity to the events and the athletes themselves. Whether viewing the games on TV or participating in them first-hand, sports are undoubtedly one of the most popular hobbies in the world. Tens of millions of people participate in organized team sports each year in the U.S., and millions more view or attend games as fans or spectators. The most popular sports differ from country to country, with places like Canada being most interested in ice hockey, while India and Bangladesh prefer cricket. The way in which fans view and follow sports has changed drastically from the days where people gathered around a radio to listen to play by play commentators describing the events. Wildly successful sports television networks like ESPN fill their entire 24 hour schedules with sports content, no matter the day or time of year. In more recent years, social media has changed the industry even further. Fans are no longer satisfied with simply watching the sporting events, but also eager to follow the daily lives of their favorite athletes. Famous sports stars are now truly global celebrities, with soccer players like Cristiano Ronaldo, Leo Messi, and Neymar accumulating over 100 million followers on Instagram alone, and hundreds of millions more across various other platforms.